Star Wars 8: Is Benicio Del Toro Related to This Classic Trilogy Villain? Big movie studios generally like to keep some level of secrecy in place when it comes to highly-anticipated movies, but when it comes to Star Wars, it is on an entirely different level. Disney and Lucasfilm only recently revealed that the official title for Star Wars 8 is Star Wars: The Last Jedi and we still haven't seen a shred of footage. 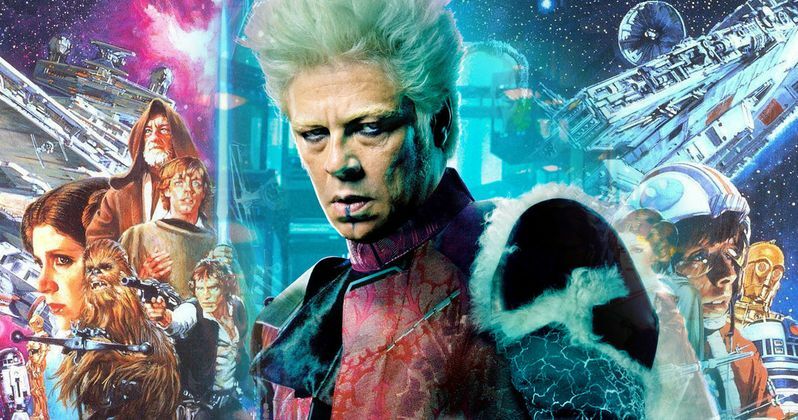 There are also still a lot of unknowns with a lot of the characters in the movie, like Benicio Del Toro, who has been added to the Star Wars universe for this installment. Details on his character have been very sparse, but now it looks like we may know who he is playing, and it is potentially a very big deal. Warning: this article may contain spoilers for Star Wars: The Last Jedi. YouTuber Mike Zeroh recently uploaded a new video to his YouTube channel that deals with the identity of Benicio Del Toro in Star Wars 8. According to his findings, Del Toro's character may be named Vicrum Fett. Yes, as in the same last name as famed bounty hunter Boba Fett. Mike Zeroh claimed to find this information from Wikiwand.com. A listing on Benicio Del Toro's page at one point had his character name for Star Wars: The Last Jedi listed as Vicrum Fett. It was later changed to TBA, but as Mike Zeroh points out, a Google search will still pull up the page that shows this very character name. There are no other details to go on, so it is hard to know how Vicrum Fett would be related to Boba Fett. Could he be Boba Fett's son? Either way, it would be a big deal if this comes to pass because Boba Fett is one of the most beloved characters in the Star Wars universe and anything even remotely related to him would make plenty of fans very happy. Especially something that would expand on the lore of his character, even it does happen to be via an entirely new character. The only other details previously revealed about Benicio Del Toro's character came a few months ago from the generally reliable fan site Making Star Wars. They described the character as a "man in black," because he dresses in all black and is considered to be dangerous, but not necessarily a bad guy. He has been compared to Lando Calrissian, but the report notes that some other details they can't yet reveal make it clear that the two characters are not as similar as they may seem. Like, maybe Del Toro is playing the son of a famous bounty hunter? He also may be the proprietor of some sort of space casino, which could be fun and also seemingly fitting. There was also another recent theory that claimed Benicio Del Toro could be playing an older Ezra Bridger, the protagonist of the Star Wars Rebels animated series. It should be said that, even though there is some evidence, this is fairly thin so it should be taken with a grain of salt for now. We're probably going to have to wait until December to find out for sure, but we will possibly get some clues this April during Star Wars Celebration. The first teaser for Star Wars 8 is expected to drop during the event and that could provide a clue or two as to whether or not Vicrum Fett is actually who Del Toro is playing in the movie. The cast for Star Wars Episode VIII includes Daisy Ridley, John Boyega, Adam Driver, Domhnall Gleeson, Oscar Isaac, Carrie Fisher, Benicio Del Toro, Laura Dern, Gwendoline Christie, Andy Serkis, Lupita Nyong'O and Mark Hamill. Star Wars: The Last Jedi is written and directed by Rian Johnson and is set for release on December 15. You can check out the full video for yourself below.